Leaders and advocates in each of the states represented in the Consortium come from the public, private and non-profit sectors, including government agencies, medical practices, hospitals, health clinics, community medical center, universities and insurance providers, all committed to promoting CRC screening. This year the Consortium is being hosted by the Louisiana Colorectal Cancer Roundtable (LCCRT), a statewide coalition of organizations and individuals dedicated to reducing the incidence of and mortality from CRC in Louisiana through coordinated leadership, strategic planning, and advocacy. During this three day event, participants will hear about novel strategies and solutions for addressing colorectal cancer challenges, and will have ample opportunity to engage in discussion with subject experts. Kicking off the Consortium will be Dr. Richard Wender, Chief Cancer Control Officer at American Cancer Society, who just recently announced updated screening guidelines for colorectal cancer. This updated guideline recommends initiating regular screening at age 45, instead of age 50, as new data have emerged about the changing risk of colorectal cancer in young adults. 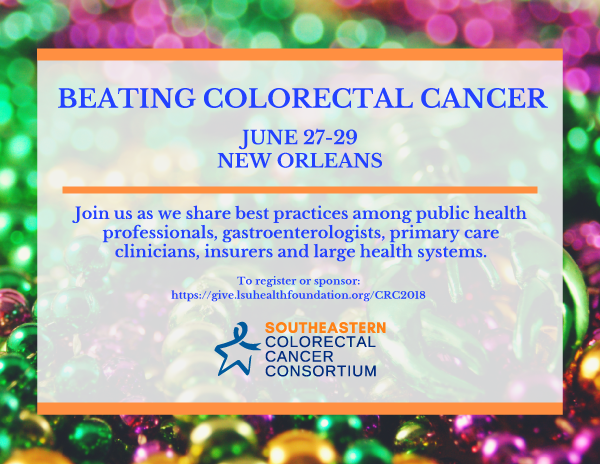 Other headlining speakers hail from the Centers from Disease Control, the National Colorectal Cancer Roundtable, the University of California San Francisco, and locally, Louisiana Cancer Prevention and Control Programs. Many other colorectal cancer champions will be speaking during this three day symposium. See https://give.lsuhealthfoundation.org/crc2018 for agenda and registration information. We certainly hope you decide to join us at this important event.